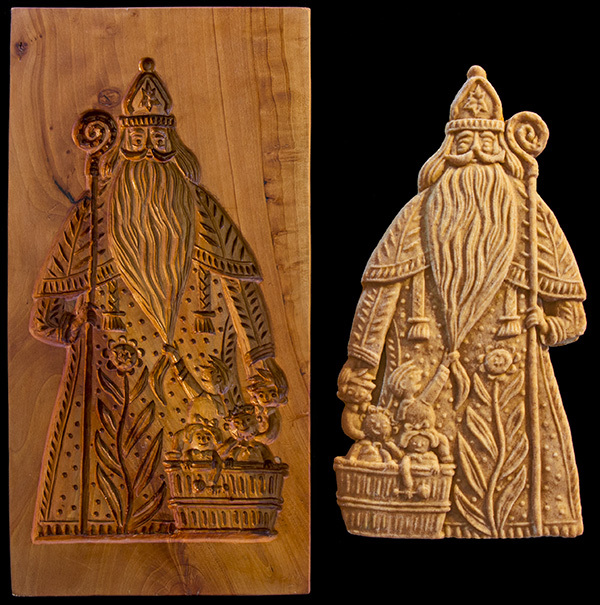 Master woodcarver, Oldrich Kvapil, who lives in the Czech Republic, has been hand-crafting wooden cookie molds for the last 30 years. 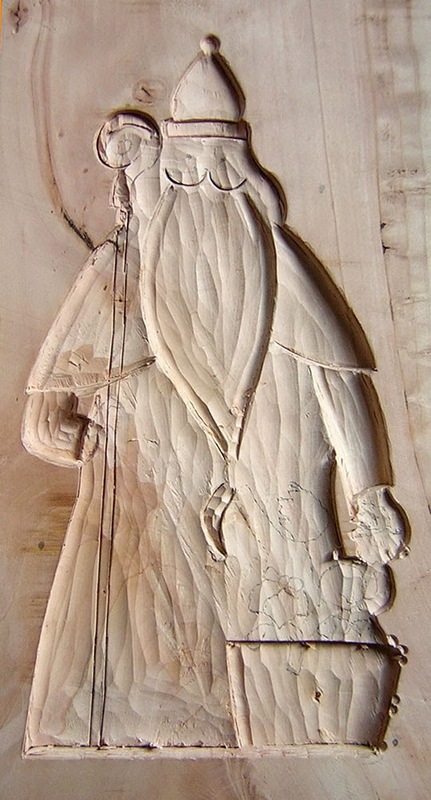 He was formerly a road construction engineer but is now retired and spends his time carving cookie molds full time. 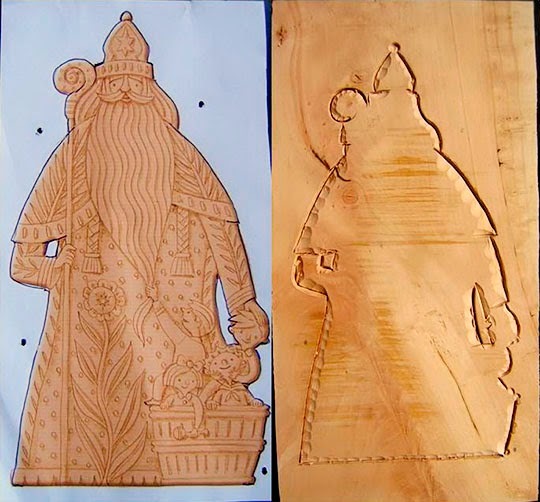 Below is his account of the wooden cookie mold carving process. Some of his comments were modified for the sake of clarity. 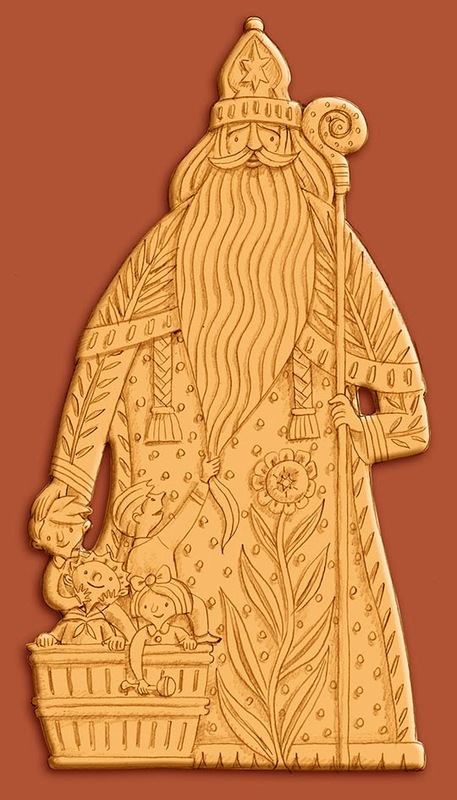 I received a pencil picture of St. Nicholas from the designer. When I start a mold I have to study the picture first. I have to find the difficult places. I have to choose the type of wood. If I find many small details then I choose pear wood. This is the best wood for me. Cherry wood is good too but it is difficult to carve when there are small details. Next, I have to imagine the design in 3D. The most intricate part of this design is the four children in the basket, especially their faces and small hands. 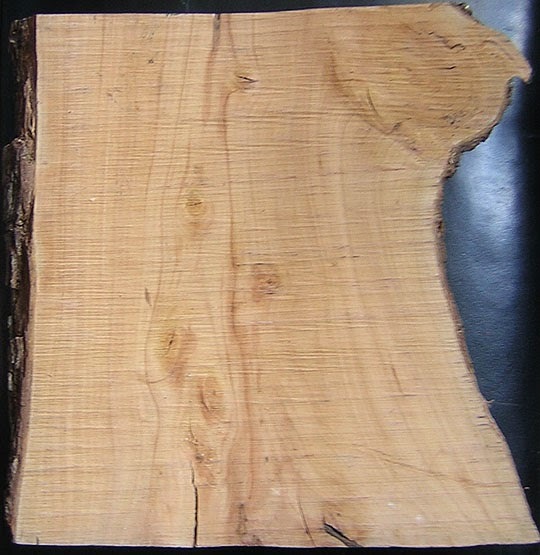 I am going to find a suitable piece of pear wood. My friend, beekeeper Jan, felled a pear tree in his garden two years ago. He gave me the wood from this tree. I am going to cut a suitable piece from this board. I love wood that has some knots. Working around them is interesting for me. I feel as if we are both in a friendly fight. I cut the board measuring 15 cm x 29.5 cm. I plane the board with my hand plane. I draw the outline of St. Nicholas on the board. You can see the wood knots in the board. 1. I prepare a paper template. I flip the design to the mirror position and I print it at actual size on a piece of paper. I make four small holes outside the outline. The outline of a design is very important for speculoos cookies. It must be bold and simple without protruding or thin parts, otherwise pieces might break off in the baking process. 2. 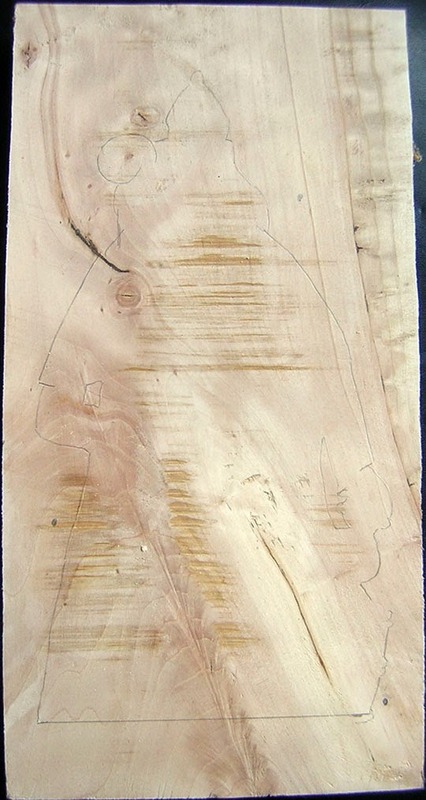 I put the paper template on the wood and make a mark through the holes in the paper. 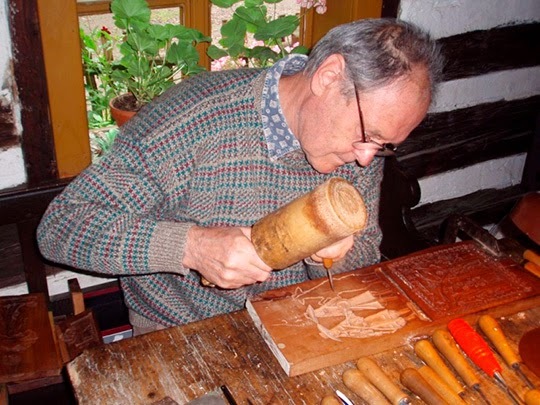 It is important to be able to re-register the template since it serves as a guide in the carving process as I proceed step by step through the different levels of carving. 3. I cut around the outline of the wood. A well-defined edge around the outline is very important in order to protect it against accidental nicks when carving. I look forward to the next step in the work…. I remove the first layer with a wide chisel. Notice the area near the outline is intact because the edge was clearly defined first. Now I divide the design into six different depths: 1. St. Nicholas' head with his miter (headgear) 2. the crosier (staff) 3. the mustache and beard 4. the chasuble (outer cloak) on his shoulders 5. the children in the tub and 6. the robe. I mark these parts and progressively remove each layer of wood. The outlines are made by tracing them on the paper with a ball point pen which leaves a faint mark in the wood. Then I use a pencil to make the outline more visible. 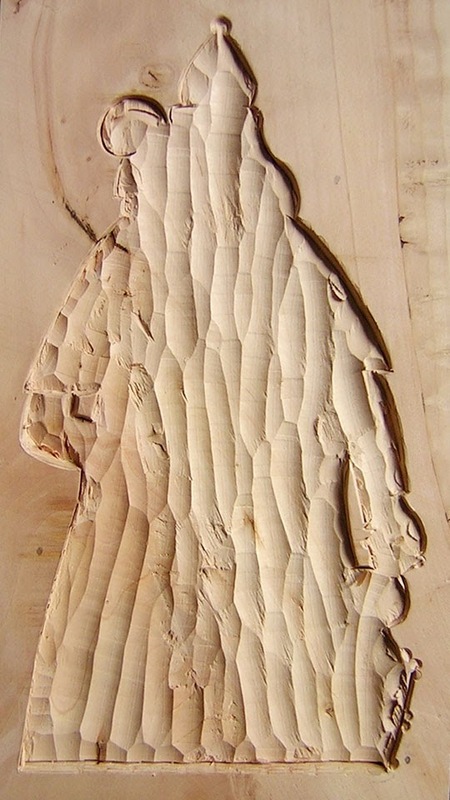 If the wood has an uneven surface I punch through the paper with a small blade making a dashed line. I connect the dashed line with a pencil to complete the outline. I think the most intricate area will be the children. Finally, I carve the small details. 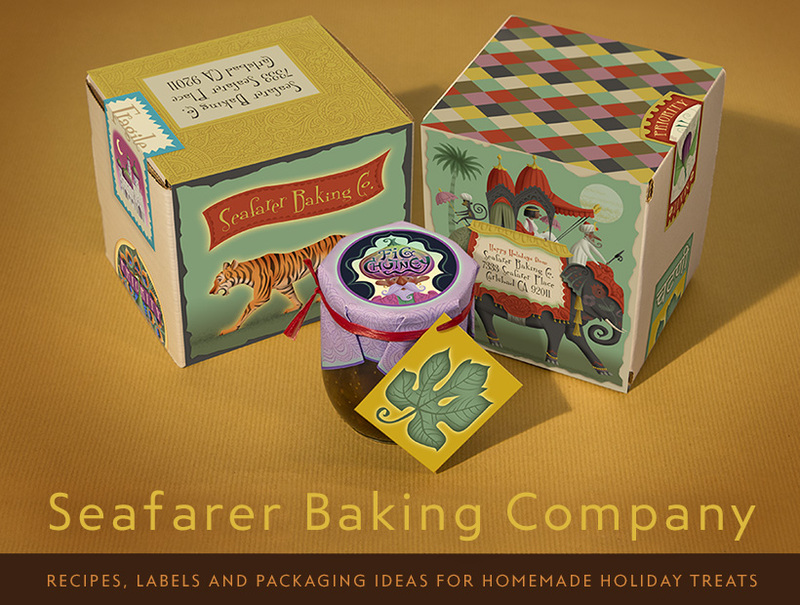 I ask my relative, Mr. Ales Vostrez, to bake a cookie from this mold. As you can see, the cookie is a mirror image of the mold, matching the original pencil drawing. Mr. Kvapil takes commissions for custom designs and his pricing is very reasonable, considering the time-consuming hand-made process he follows. Serious inquiries can be made by emailing him at: okvapil@gmail.com.